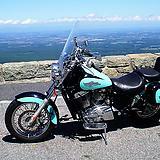 Honda Shadow Forums : Shadow Motorcycle Forum > Local Discussion > Gotham State Riders > Virginia Anyone? New Member and wondering if anyone lives in Virginia? Warrenton, Fredericksburg, Northern Va area? I was born and raised in that area, but have lived in Houston for the past 20 years. I'm originally from Fairfax, later moved to Oakton where I went to H.S. Hi Sue, I'm new to the forum, but I am in Richmond VA. A little way from NOVA and Fredericksburg, but not far.